Jaguar Colorado Springs offers a large selection of luxury Approved Certified Pre-Owned Jaguar models in our inventory. These gently-used Jaguars have passed a rigid 165 multi-point inspection to earn the prestigious Jaguar Approved Certified Pre-Owned designation. Don’t miss out on this special vehicle, an elegant Certified Pre-Owned Jaguar F-PACE 30t Premium. This amazing crossover was recently retired from our service loaner fleet and has been driven very little, only 6,703 miles! Enjoy benefits of owning a Jaguar Approved CPO vehicle including a $0 deductible 6-year/100,000-mile transferable limited warranty, and 24-hour roadside assistance. The 2018 Jaguar F-PACE delivers an athletic driving experience. This super-clean Caesium Blue Metallic F-PACE is powered by a robust 296-horsepower turbocharged 2.0-liter I4 engine. Paired with the engine is an efficient 8-speed automatic transmission. This powerful combination offers stellar performance and fuel-efficiency, earning an estimated 22 MPG in the city and 27 MPG on the highway. The convenient all-wheel drive system delivers excellent traction in winter driving conditions. The passenger cabin of this stunning sport utility vehicle is loaded with premium options the whole family will adore including the Cold Climate Package, Protection Package, InControl Navigation, and wheel locks. The Cold Climate Package delivers features needed on cold winter days including heated front and rear seats, windshield, steering wheel, and washer jets. Plush Oyster leather seating is made from soft materials and cradles passengers on long road trips. Make your trip enjoyable with luxury amenities including the immersive 11-speaker 380W Meridian premium sound system, power liftgate, power moonroof, SiriusXM satellite radio, and so much more! Download the Shell app and use the 8-inch infotainment touchscreen to make your fuel purchase from the comfort of your F-PACE. There are so many innovative features on this beautiful CPO 2018 Jaguar F-PACE! 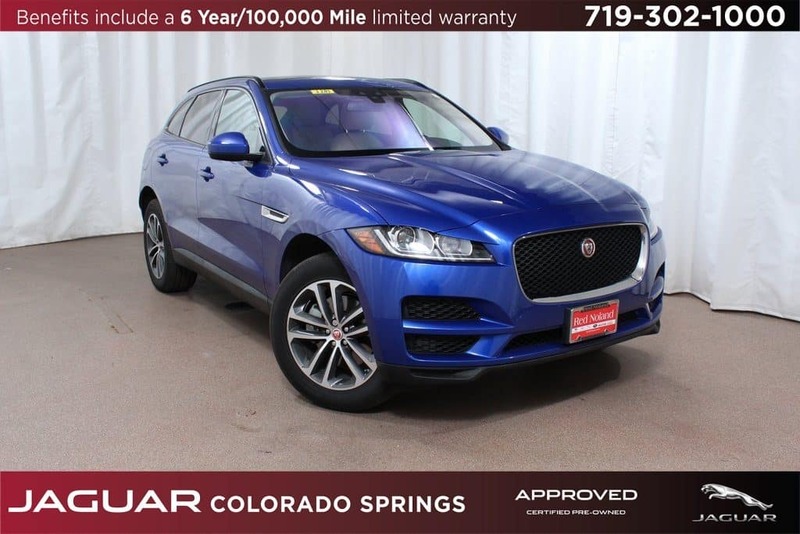 Drive this feature-filled CPO 2018 Jaguar F-PACE 30t Premium home today with the low Jaguar Colorado Springs price of only $45,989, over $8,800 below MSRP! Stop in for your test drive today!